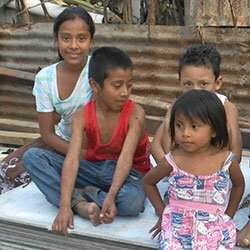 The Carmelites in El Salvador are working hard through these mission projects to change lives by providing resources and tools to families and individuals in need. Whether it is promoting self-sustaining programs like the Chicken Industry or helping with emergency medical needs or providing educational scholarships, these programs work to strengthen our community and build a family of faith. Project St. Elijah and our second foundation are major steps forward for our province’s ministry in El Salvador. The small piece of land for the second foundation will allow us to construct a small sanctuary dedicated to Our Lady of Mount Carmel as well as a formation house for the professed students. Project St. Elijah will become a working cocoa and fruit farm where our formation students will work. This farm will provide a steady income for the Carmelite community’s ministry in El Salvador. One of our scholarship recipients studies in the library. Each person has the right to an education. Achieving this is a goal of the Carmelites in El Salvador. Despite the relatively low cost of education, most families lack the resources to pay for their children to attend school because the average worker earns only $98 to $252 per month. The Carmelites currently sponsor ten young people attending university and 30 young boys and girls attending high school. Students are able to receive these scholarships for all four years. We need to do more. Baby chicks for distribution to families. “Give a man a fish and you feed him for a day; teach a man to fish and you feed him for a lifetime.” Projects, which produce sustainability as well as self-sufficiency, are critical in the country of El Salvador. The Carmelites are addressing this in a variety of ways including the “Family Chicken Industry.” We give five families 100 chicks and enough feed for the chicks for three weeks. This process is repeated for three straight weeks. In the fourth week, the families sell the chicks they received the first week and are able to buy additional chicks and the necessary feed. However, with the revenue generated, they also have money to purchase needed items for the family. The Prior Provincial, Fr. William J. Harry, joins three of the Carmelite students, Br. Benjamin Salas, the director of the Association of Our Lady of Mount Carmel, Henry Cienfuegos and Francisco Zeledon of Centro Xiberta for a discussion about the Feast of Our Lady of Mount Carmel and the Carmelite scapular on El Salvador’s Radio Maria. One component of Carmelites in ministry is to evangelize as well as promote Carmelite spirituality. Today, one of the most effective ways of doing this ministry, especially among the young people, is through the use of social communication. The Carmelites in El Salvador have a presence in the various forms of this new media. However, the traditional forms of media (holy cards, magazines, pamphlets, etc) are also very effective in getting the message of the Church and the Carmelites into the hands of the people. We have created an active Facebook page (Vocaciones Carmelitas El Salvador, (Centroamérica) with some original content. We distribute nationwide the magazine of the Carmelite province which contains articles specific to El Salvador as well articles on current events in the worldwide Order. Carmelite student Jesus Paz interviews Lay Carmelite Cecilia Artiga as part of the Vocare Deo series on the Carmelites in El Salvador produce for Facebook. The series introduces people to various aspects of Carmelite history and spirituality. Funding for this office is $500.00 per month. This includes one salary for a person with the expertise to produce original content. 15 families benefiting from plant and supplies for their home gardens. The goal is the production of fresh vegetables for their families’ consumption. Food is a basic necessity and often drains the family’s meager earnings. This project is one of the Carmelite outreach programs to address this situation. With the donations received, 10 families are provided seeds to grow vegetables. They are then able to use some of the vegetables for themselves. They also sell the vegetables providing an income to purchase needed items for the family. Does this work? Absolutely. One father of a family participated in this project and, besides providing fresh food for his family, was able to buy a cow. Over a period of time, he was able to purchase a second cow. His family now has fresh milk and he is able to sell milk to others. Strong community connections through food and fellowship enrich all our lives. To build a future in El Salvador, the Carmelites are deeply involved in the formation of young men who feel called to religious life. The Centro Xiberta Formation House is the community of the young men who are considering a journey in Carmel. Besides studying at the Universidad Central America, they learn the fundamentals of living together in community. One key part of this Carmelite life is to “live among the people”—not to become isolated but to understand the lives of the people who are our neighbors. The Centro Xiberta community is located in the Canton La Cabaña, countryside area of Ciudad Delgado. It is an extremely violent area in the most violent country in the Americas. It is important that we also build relations with our neighbors so that we can live in peace with each other. Every Saturday morning the neighbors of the Centro Xiberta Formation House join the community for morning Mass. Following Mass, the neighbors are invited to a simple breakfast of a sandwich and something to drink—coffee or hot chocolate. The chapel is filled to overflowing. To facilitate our work with the students, our neighbors, and the local Church, we were able to purchase a used pickup truck through the generosity of donors like yourself. This truck has been a major help. We thank our donors for their generosity and remember them daily in prayer.